The Team USA women's gymnastics team has been absolutely slaying at the Olympics this year, and in addition to busting out insane trick after insane trick (and making them all look totally effortless), their beauty game is also seriously on point. If you saw and became instantly obsessed with Simone Biles' red, white, and blue glitter eyeshadow and are wondering how to copy it, I've got the details on what you'll need so steal her sparkly look. She may be a first-time Olympian, but Simone Biles is making a serious presence at the 2016 Rio Olympics. She's already scored her first gold medal, and earning more over the next few days is a serious possibility — but we also have to mention the fact that she looked seriously glam doing it. 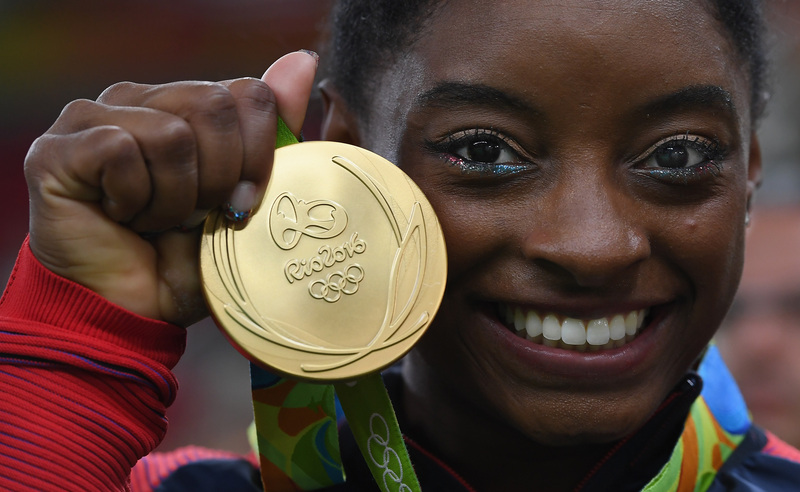 Biles rocked a USA-inspired red, white, and blue glitter eye, and it made a serious sparkly statement. The patriotic makeup featured alternating red, white, and blue glitter eyeshadow underneath her eye, and she finished with a thick, bold lash for a little extra drama. It was totally glam, a lot of fun, and seriously showed off her Team USA spirit. Also, it looked pretty darn fab next to that sparkly gold medal. NBD. So flawless. Show off that medal, girl. Want to know how to steal it for yourself? Here's what you'll need. A pen makes it super easy to apply as liner. This blue liner would also look amaze in the winter. Choose a silver for a little extra sparkle. To steal Biles's look, apply the red at the outside of your eye, the silver in the middle, and the blue by the inner crease.